In the last six months or so, the real-time web has really started to take hold. Services like Facebook, FriendFeed, and YouTube are finding ways to update their services on the fly with impressive results. But aside from Twitter, there haven’t been many sites built from the ground up with real-time in mind. Until now. Today sees the launch of Vyoom, which may well be the first robust social network to launch with real-time at its core. 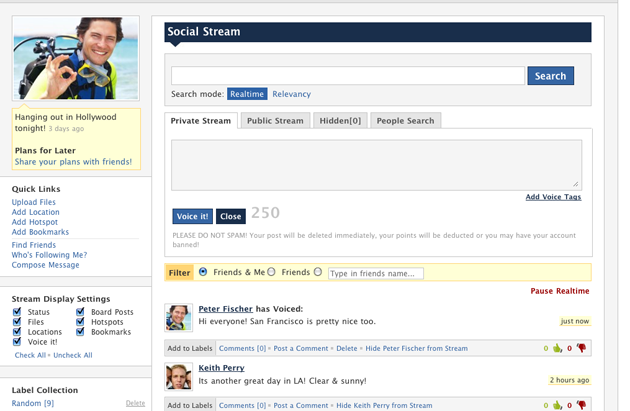 The site behaves (and looks) like a mix between Twitter and Facebook. You’ll be spending most of your time in the ‘Social Stream’, which is a constantly updated list of the latest status updates posted by both your friends and other members of the site. The Social Stream is broken down into two sections: the public stream, which shows every update posted to the site by anyone, and the private stream, which shows updates posted by your friends. All updates are displayed immediately after they’re sent — you never have to refresh the site or click a ‘show new updates’ button. And if things are flowing by too quickly you can always hit pause. This can add up to a lot of content, so Vyoom lets you filter and search through each stream, which is where the site’s real power may come from. The public stream allows you to restrict updates to a certain network (for example, I could display only updates that came from San Francisco) while the private stream lets you search for updates by a certain friend. Finally, there’s a stream-wide search similar to Twitter Search which allows you to find any updates with a certain keyword. If the site manages to achieve a large number of users (which is obviously easier said than done), then this search functionality could prove more flexible than Twitter’s. 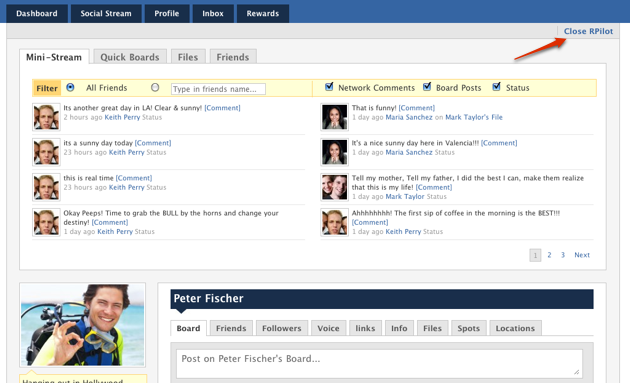 Outside of the main stream, the site has most of the features you’d expect from a social network. You can build a profile displaying your photos and interests (along with a Facebookesque Wall), and there’s an integrated Mail system. The site includes a nifty feature called RPilot that’s effectively a miniature version of the Social Stream described above. The RPilot (pictured below) allows you to navigate through the site without ever having to take your eye away from the constantly updated stream. Another way that Vyoom differentiates itself from Facebook is its point system and Rewards store. Facebook has been toying around with points and a payment system for a while now, but aside from a few Platform apps in testing the only thing you can use them for are virtual gifts. Vyoom is taking a different approach. The site rewards users for executing various actions on the site, like inviting friends to join, sending messages, and so on. After accumulating many of these points, you can exchange them for gadgets like cameras and PS3s, though these go for millions of points (you start with around 70,000, and get 5,000 for every friend you invite who winds up joining the site — so start inviting). Vyoom is quite well done and I like the fact that real-time was kept in mind during the site’s formation, rather than as a tacked on feature. But the social network space has become very difficult to carve a niche in — everyone seems to already have a Facebook (or decreasingly so, MySpace) profile, and getting them to maintain yet another site is going to be tough. The site’s Rewards features may be enough to entice some users, but it may also be a double-edged sword: if Vyoom makes it too easy to win expensive gadgets, they’ll quickly run out of money; make it too hard, and users will scoff at the points system entirely. Still, rewards system aside, Vyoom does a good job walking the line between Twitter and Facebook, which may be enough for many users to give it a shot. Vyoom: Where Social Activity is Rewarded! from Mark Takenaka on Vimeo.